For some time, the Minx has been pushing for us to eat more fruits and vegetables. While I'm not averse to eating vegetables and sometimes prefer a vegetarian meal over something meat-centric, I'm often challenged by the task of making vegetable dishes tasty and satisfying. I have a relatively small number of tricks up my sleeve, one being to make Indian-inspired dishes, but getting the seasonings just right is daunting. Another trick is to make gumbo since I've learned how to make a dark roux quickly and I can nail the Cajun/Creole flavor profile more easily. Recently, the Minx signed us up for a CSA (community supported agriculture) that delivers a box of fresh fruits and vegetables to our door when we place an order. Among the items we received was Swiss chard, so the Minx tasked me with using the Swiss chard in our dinner. 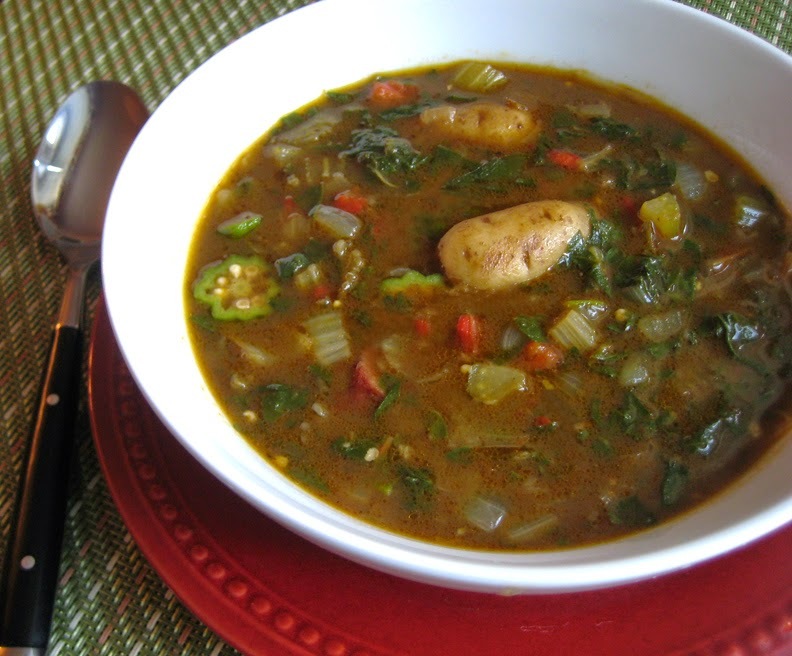 Since we also happened to have onion, celery, and a bell pepper, gumbo seemed to be the best option. It would also give me a chance to use some of the chicken andouille sausage that had been languishing in the freezer for weeks. Normally I would make rice to go with gumbo, but we happened to have some small potatoes around, so I thought that might be an interesting twist. I also threw in some okra that I had picked from the garden, but it's not absolutely necessary for the recipe. The silky Swiss chard is the star here. Chop your onion, celery, and bell pepper and set aside. Also slice your three andouille sausages and set aside. Preheat a large pot until it starts to smoke and put in your butter and flour. Stir constantly until the butter and flour are combined and begin to brown. This is your roux. Keep stirring until the roux turns the color of dark chocolate. There will be quite a bit of smoke, so don't panic. That's just the way roux cooks. Once the roux reaches the right color, throw in your trinity (onion, celery, and bell pepper) along with the sliced sausage. Toss a little bit of salt in to release the juices from the vegetables. Reduce the heat and mix everything together. Put a lid on the pot and allow the onion to sweat. At this point, smash the garlic with a garlic press and dump it into the 2 cups of chicken stock. Once the onions have become translucent and the roux has become liquidy, pour the stock and garlic into the pot. Raise the heat and stir. Once the mixture reaches a boil, toss in the fingerling potatoes. Depending on the size, you can leave them whole or, if they are too big, cut them into finger-sized chunks. Turn the heat to medium and let simmer. Remove the leaves of the Swiss chard from the stems. Dice the stems and add them to the pot. Give them about 10 minutes to cook. Meanwhile, roughly chop the Swiss chard leaves. After the stems have cooked for 10 minutes, add the leaves and the seasonings. Adjust the seasoning to your own taste. Once the leaves have cooked for about five minutes, the gumbo is ready to be served.